THE ONE WHERE Klaus decides he wants to reclaim New Orleans, and discovers he’s about to become a dad. VERDICT What an odd episode of The Vampire Diaries . Mainly because it wasn’t really an episode of The Vampire Diaries but an episode of The Originals , setting up the format for the Klaus & Co spin-off. And as a pilot it was fine. A bit talky, perhaps, and not giving all the new characters a chance to make an impact (especially the witches), but certainly intriguing and atmospheric enough to leave you wanting more. But it still felt a bit odd plonked in the middle of a season of The Vampire Diaries , especially as it wasn’t a self-contained story but a jumping-off point. Suddenly, when The Vampire Diaries should be gearing up for its season finale, we take a detour to New Orleans with Klaus and co, that’s enjoyable enough in itself, but does nothing to help rectify the already listless, meandering arc plot of the parent show this year. In fact, it pretty much highlights how disjointed and lacking in momentum it’s become. The episode starts off with a fairly perfunctory Mystic Falls scenes with Katherine showing up to tell Damon and Stefan, “You know that guy who’s been a major part of this show for the past two and half seasons? Yeah, well, don’t worry about him any more. He’s got his own spin-off now. Good riddance, eh?” It almost feels like one of those awkwardly-staged framing scenes you get in “clips” shows, when the characters have to find excuses to “remember” their best moments. Once the action moves to New Orleans, though, the episode hits its groove. Sure, there’s an element of travelogue, but the Quarter is used evocatively, and the encroaching modern sections of the City are cleverly integrated into the mythology as well. While Marcel and his vampires rule the Old Town (where “he blood never stops flowing and the party never ends”), the skyscrapers are regarded as little more than multi-storey larders. The basic set up is certainly enticing and a solid basis for the new series. Marcel, once Klaus’s protégée, now rules the roost in Klaus’s old haunt, and has even exceeded Klaus’s successes. The vampires rule the Quarter, werewolves have been run out of town, humans look the other way and the witches have been cowed. There’s also some guff about Klaus becoming a dad thanks to his one-night stand with Hayley, but his initial, typically response to that is to tell Elijah to kill the girl and the baby. Elijah tries to convince him about the value of family, but Klaus only – finally – comes over all paternal when he realises that having an heir may be useful in his new scheme: to take back New Orleans for himself. He’s jealous of what Marcel has achieved, y’see, and he wants it for himself. And if that means going into league with the witches, then so be it. It’s stylishly shot and both Elijah and Klaus feel like perfect fits in this dusky, supernatural soup of a city, though for different reasons. Klaus plugs straight into the bloody underbelly of the place but also has an empathy for artistic vibe going on. Elijah’s sharp-suited silhouette looks wonderfully anachronistic yet at the same time impossibly cool amongst all the hedonism; it’s as if he’s regarding all this nonsense from a slightly aloof standpoint, but enjoying it nonetheless. They’re going to fit in fine. Of the new characters, Marcel fares by far the best, and he looks set to be a very intriguing antagonist for Klaus. The backslapping bonhomie barely conceals a spirit of steel, the teeth turning form broad smiles to bared fangs in microseconds. But the loyalty he commands makes him a dangerous man to cross, and there’s a nice little scene where he knocks back some vervain in plain view of Klaus, just so he can make the point that he’s desensitizing himself to things that could affect him. The witches are pretty bland, though, and none of Marcel’s underlings get much in the way of fleshed-out characters. Aside from Marcel, only “brave barmaid” Cami makes any kind of impression, which is slightly odd since there are no clues here what role she might perform in the series proper, except, potentially, as love interest or shoulder to cry on for Klaus. Presumably it will be more than that, though. She’s certainly got bags of charisma. So, if this were a just pilot, then yeah, it does a solid enough job making you want to watch more, though maybe it could have done with a little more action and a few of the exposition scenes pruned back a bit. Elijah, particularly, seems to want to over justify everything and tell anybody in the vicinity. Promising though. But just when you’re looking forward to the next episode you’re reminded that the next episode will be of The Vampire Diaries , not The Originals . It’s a kind of a jolt seeing Damon and Stefan getting ready to torture Elena back to humanity, but on the other hand… it is a very good scene. Elena’s basically saying, “Bring it on!” and from her final expression, we’d put out money on the brothers breaking before Elena does. GREEN LIGHT A GO-GO The CW gave the green light to take “The Originals” to a series a day after this episode aired in the US. Rebekah wasn’t in it much but she will be a permanent fixture in the series when it airs. KLAUS MUG SHOT OF THE WEEK Cami’s insights into the painter’s psychology are supposed to be having a profound, effect on Klaus – a moment of epiphany, in fact – but here he looks like he’s straining to keep a straight face through her philosophical twaddle. WEREWHAT? Jane-Anne tells Hayley that in the bayou the werewolves are called rougarou, which are indeed what were werewolves are called in Cajun folklore (as the Winchester brothers know). 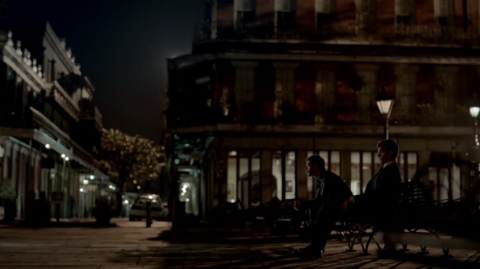 • 75% of the show was shot in the French Quarter of New Orleans with almost entire Vampire Diaries crew on location. • Some scenes were filmed in Lafayette Cemetery No. 1 where Interview With A Vampire was filmed. • The tour guide who appears after the title card is the actual tour guide, Jonathan Weiss, who gave Julie Plec and Michael Narducci a tour on their first research trip. • The drummer in the scene where Klaus talks to Cami is Julian Addison. He is a musician that Paul Wesley, Torrey DeVitto and Julie Plec saw play when they were in town for the Super Bowl. • The painter who’s featured has his own gallery on Royal Street in New Orleans. • The location where Klaus and Elijah have an argument is Pirate's Alley. • The vampire party was shot at the Hotel Royal on St. Patrick's Day weekend, much to the annoyance of some of the normal guests. Daniel Gillies almost took a punch from an angry patron. • The brass band in the parade sequence is the famous band Rebirth and their high-steppers, one of New Orleans' oldest musical traditions. • Joseph Morgan and Charles Michael Davis were former poker-buddies well before Charles was cast as Marcel. • The unaired “presentation” version of “The Originals” has an entirely different ending sequence. Klaus: "What an entirely unwelcome surprise." Elijah: "And what an entirely unsurprising welcome."